This piece was written by one of the data scientists on Classy’s data insights team, Page Piccinini, PhD. Mobile traffic has been steadily increasing over the years, and mobile giving has been following suit (Statista 2017; Blackbaud 2017). To identify behavior patterns around this trend, we dug into mobile giving data on the Classy platform. Below, we dive into this data, share some key findings on the types of users that are donating through mobile devices, and discuss why these data points matter for your next fundraising campaign. 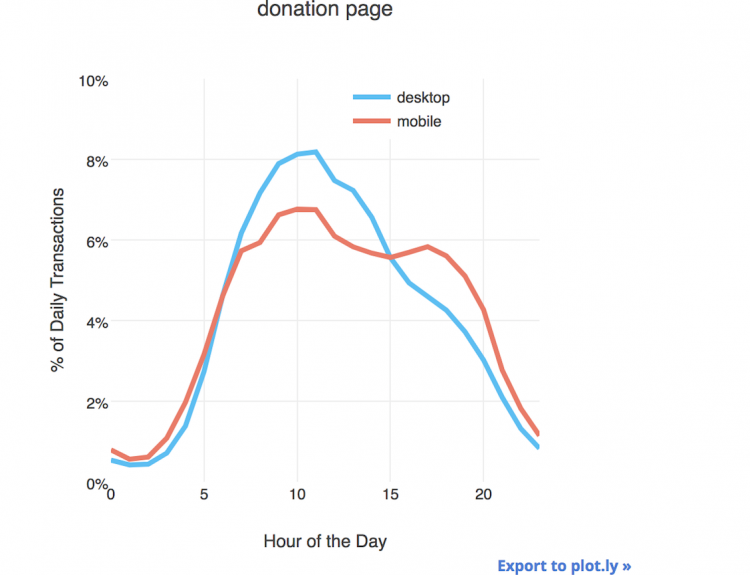 The rise of both mobile traffic and giving is largely a product of social media sharing. In 2016, 42.6 percent of all visits to Classy’s donation forms came from mobile traffic. In 2017, mobile traffic accounted for 50.3 percent of all page hits. Most of the traffic on mobile comes from social media (Facebook, Twitter, Instagram) at 59.8 percent of referrals, and 89.4 percent of those are specifically from Facebook. Conversely, on desktop, only 37 percent of traffic comes from social media. This is unsurprising, given that over 90 percent of Facebook’s daily active users are on mobile devices (Facebook 2017). 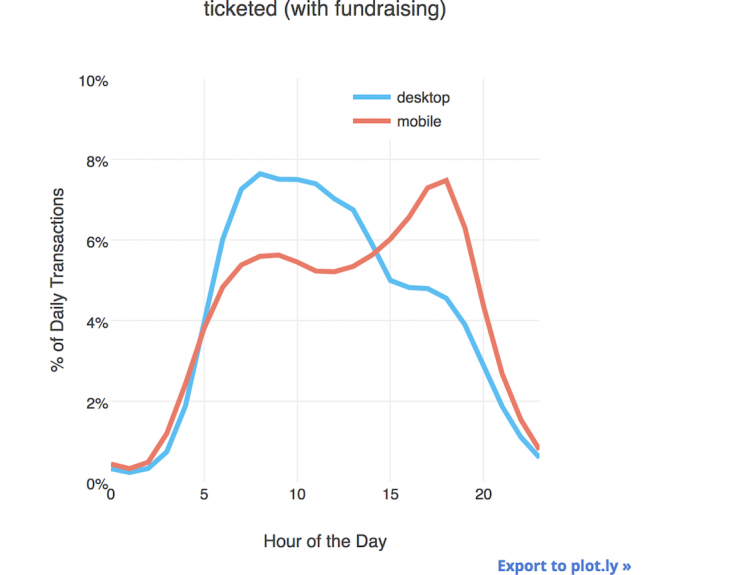 When we drill down into how this mobile traffic translates to transaction volume, we see that this traffic especially impacts campaigns with peer-to-peer fundraising pages—specifically peer-to-peer fundraising campaigns, Classy Events registration with fundraising pages, and ticketed events with fundraising. To understand these trends more deeply, we must look at when giving happens and who these donors are. When trying to attract mobile donors, it’s good to know when they’re most active online and prone to give. 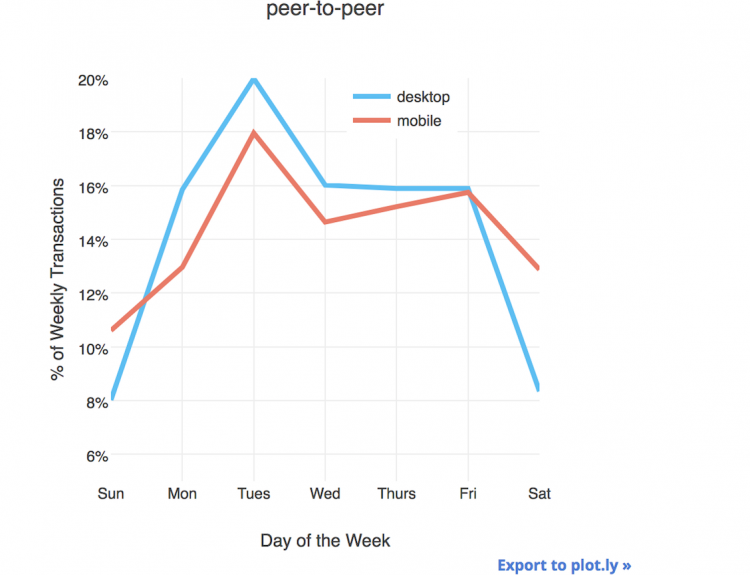 The graphs above represent the percentage of transactions on mobile versus desktop on a given day of the week. Figure 1 is unnormalized by device; all dots add up to 100 percent. Figures 2a through 2d are normalized by device; all blue dots (desktop) add up to 100 percent and all pink dots (mobile) to 100 percent. 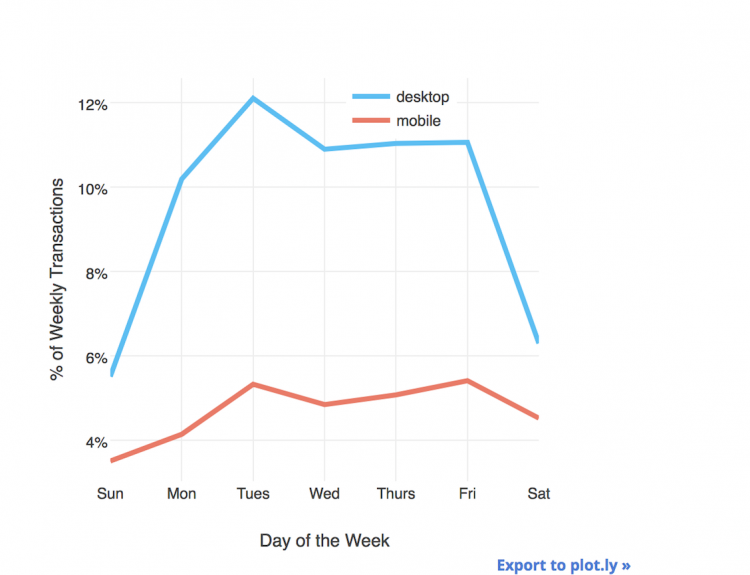 For this plot, raw percentages should not be compared head-to-head for mobile and desktop. 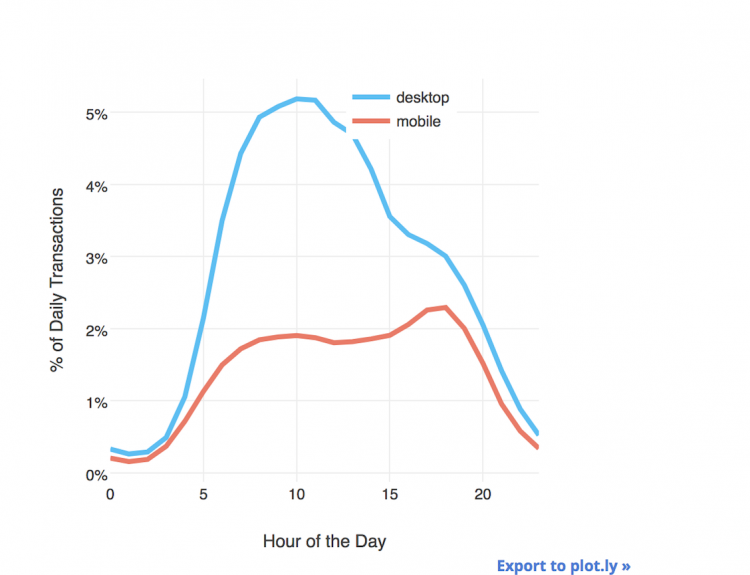 If we look at activity by the hour, the data shows a clear difference between desktop and mobile behaviors. 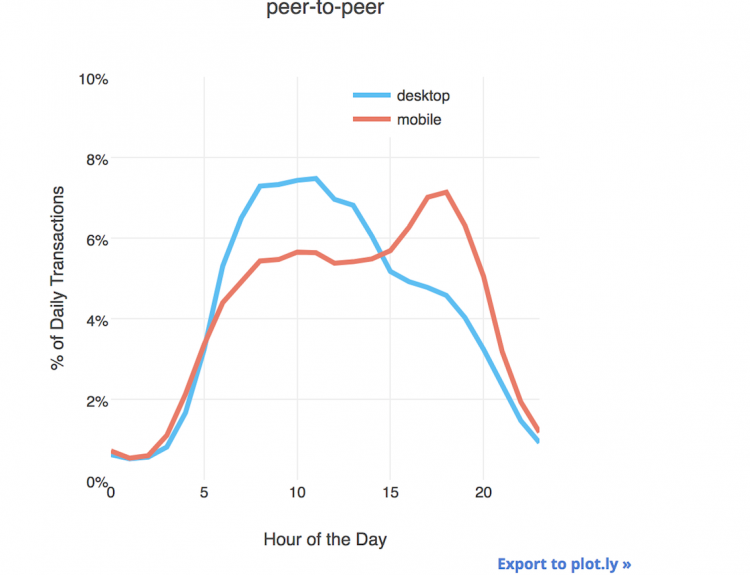 Mobile users are more active after working hours (Figure 3 below). Even more interestingly, this effect is clearly stronger in campaigns that implement peer-to-peer fundraising (Figures 4a-4d below). 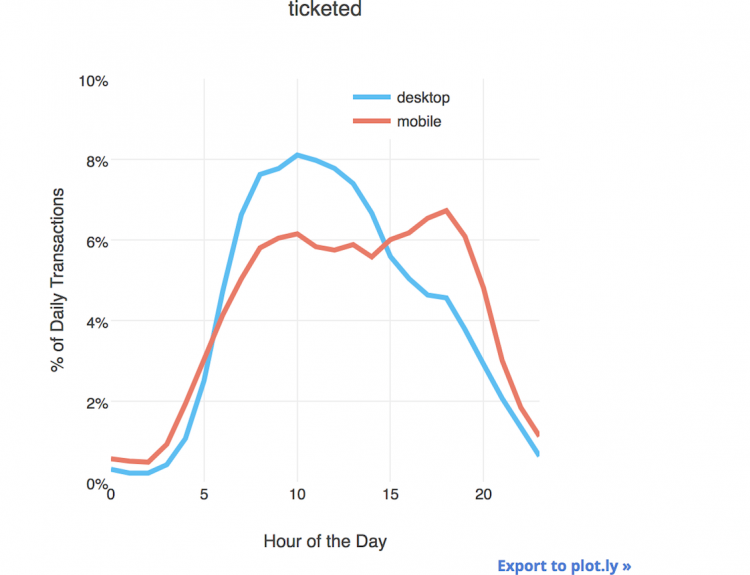 The graphs above show percentage of transactions on mobile versus desktop in a given hour of the day. Figure 3 is unnormalized by device platform; all dots add up to 100 percent. Figures 4a through 4d are normalized by device platform; all blue dots (desktop) add up to 100 percent and all pink dots (mobile) to 100 percent. 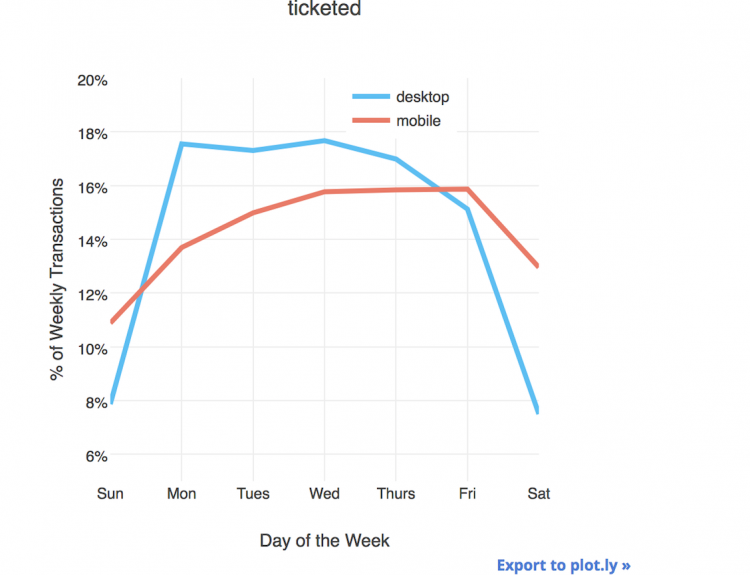 For this plot, raw percentages should not be compared head-to-head for mobile and desktop. To learn more about these mobile donors, we first analyzed where they were from. Looking at all transactions on Classy in a given state, we computed the percentage of mobile transactions for each of our three campaign types. Consistent with earlier results, ticketed events with fundraising pages and peer-to-peer campaigns had the highest percentage of mobile gifts across campaign types, across all states. 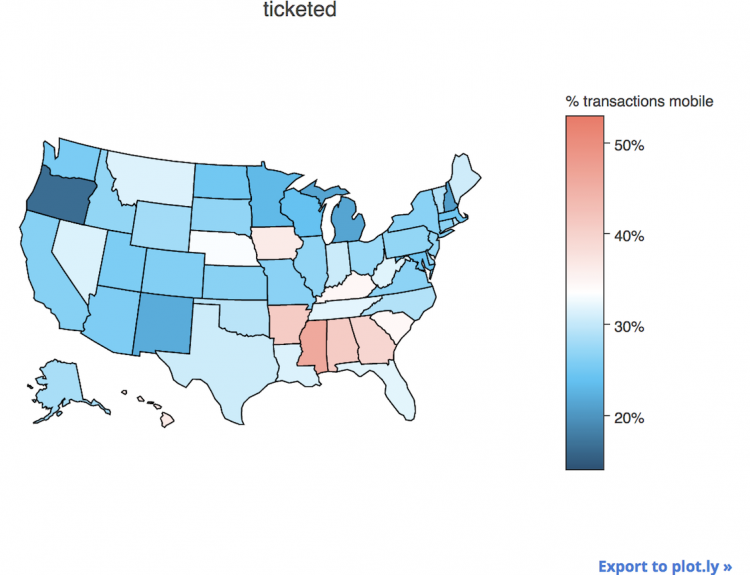 Certain states also have a higher percentage of mobile transactions than others. The “most mobile” states are West Virginia (mobile makes up 44.1 percent of transactions), Arkansas (42.1 percent), and Oklahoma (41.8 percent). 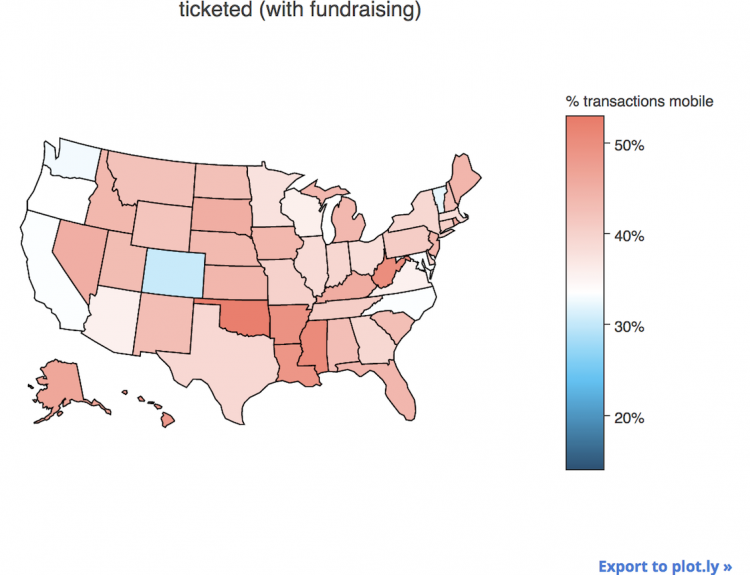 These graphs (Figures 5a through 5d) show the percentage of transactions that took place on mobile for a given campaign type for a given state. Mobile usage in general varies from state to state. 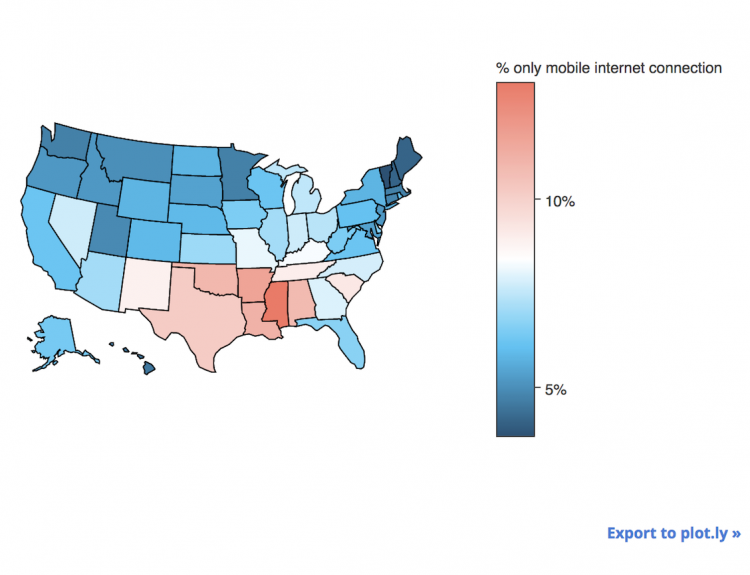 According to the American Community Survey (ACS), the southern, central portion of the United States has the highest percentage of people who only have a mobile device as their internet connection (shown in the figure below). This aligns with our earlier results from the Classy platform surrounding the states that have a higher percentage of mobile transactions. This graph (Figure 6) shows the percentage of households that have a “Smartphone with no other type of computing device” based on data from the American Community Survey (ACS). While many assume that the majority of mobile donors must be younger, that’s not necessarily the case. When we look at age, we find that mobile donors are essentially around the same age as desktop donors. The average mobile donor is 36-years-old, while the average desktop donor is 37-years-old. When it comes to specific campaigns, however, certain ages tend give to certain types of campaigns on the Classy platform. The oldest mobile donors tend to give to donation pages and the youngest donors to peer-to-peer campaigns. Between the two campaign types that involve fundraising—ticketed events with fundraising and peer-to-peer—the latter attracts even younger donors. Given this information, mobile-responsive design isn’t necessary just to attract younger people—it’s critical in engaging older generations as well. And to get even further into the nitty-gritty, it’s worth considering the estimated donor age when launching certain types of campaigns. Be sure you have a mobile-responsive site. 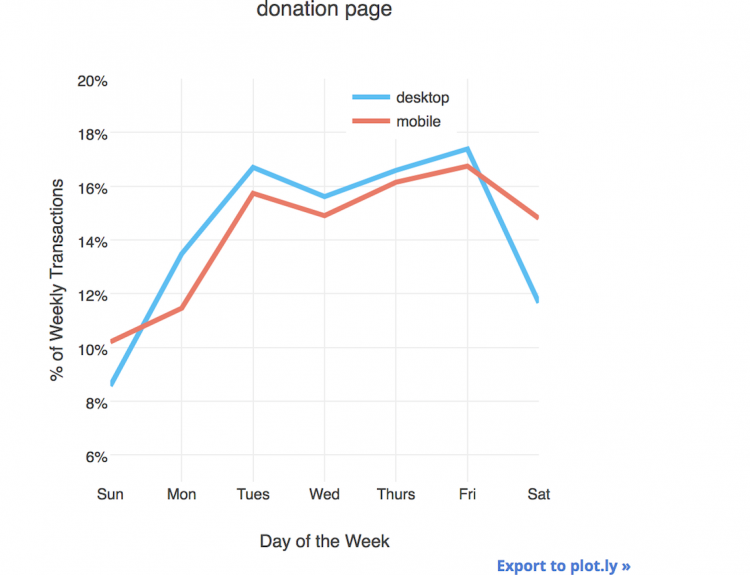 As mobile traffic increases to match desktop traffic, it’s more important than ever that your website makes it easy for donors to give on any device. Encourage Facebook shares. With most mobile traffic coming from Facebook, encourage your fundraisers to share on Facebook. It can make a big difference. Promote your campaigns on weekday evenings. 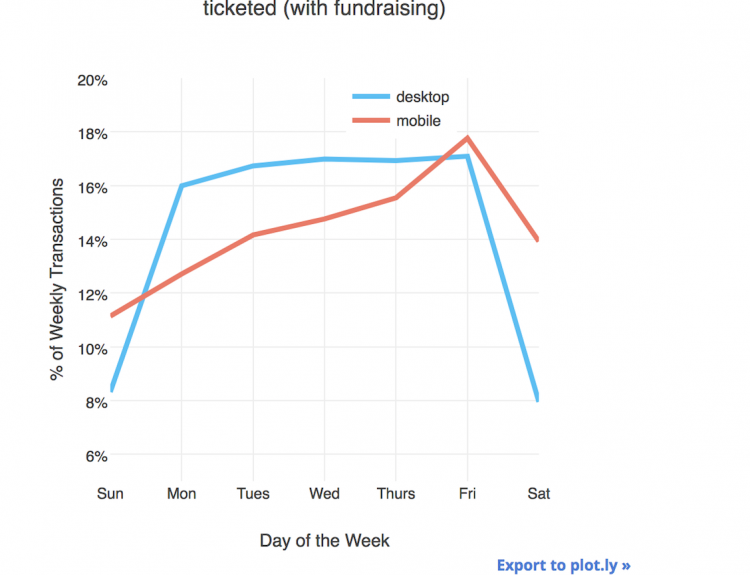 When it comes to campaigns that involve fundraising, mobile donations peak on weekday evenings. Encourage your fundraisers to share and promote their campaigns so that it’s well-timed for mobile giving. Know your target donor base. Check variables such age and mobile usage for the locations in which your campaigns may be taking place. If you know you are in a location that has high mobile usage, take extra steps to following the suggestions above. Take this data and follow these suggestions, and you’ll be well on your way to creating a fundraising campaign that attracts mobile donors. Like data analytics? Join in! If you find these analytics interesting and want to join in, let us know! We’ve published our analyses and data—for this post, as well as an appendix of extra analyses—to give some insight into the work we’ve done here and to share some of our tools. We’re also actively participating in DataKind Data Dives in collaboration with 92nd St Y on understanding giving behavior, as well as contributing to other open-source projects. Hit us up or comment below to get involved.